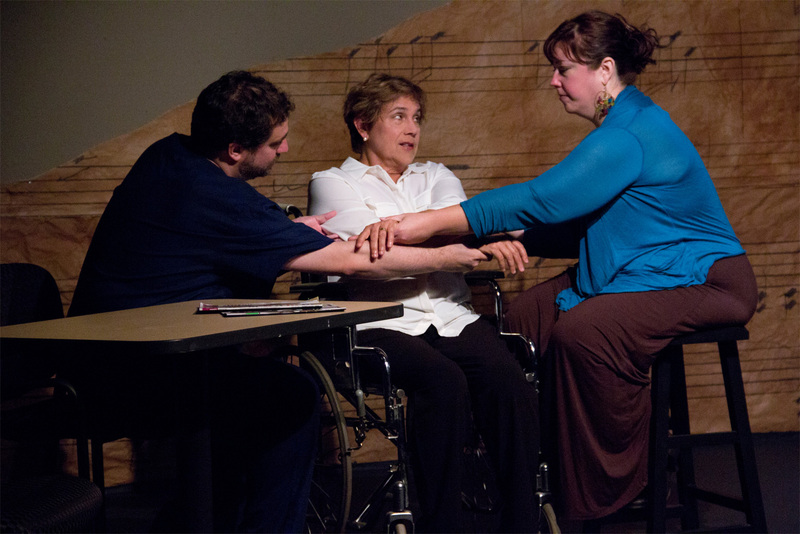 Aaron Wexler, Patricia Bartlett and Tami Feist in 33 Variations. This, this, THIS is why I’m grateful for Langhorne Players. Moises Kaufman’s 33 Variations is an ambitious play woven with Ludwig van Beethoven’s passion for composing variations on Anton Diabelli’s waltz. Diabelli, a music publisher, created a marketing scheme that became an obsession for Beethoven. The master’s mania inspires an academic fervor for the play’s Dr. Katherine Brandt, a compulsion that either contributes to an early death or adds depth to a death sentence of ALS. That is for you to decide. What isn’t up for discussion is that Patricia Bartlett, as Brandt, is a concertmaster wielding a priceless Stradivarius of an instrument — her talent. To extend the metaphor, Maestro/Director Jack Bathke has arranged a symphony in which Bartlett’s voice soars. As Brandt contracts into ALS, Bartlett expands her character’s reach. With exquisite agony, you feel her pain, particularly as she undergoes an MRI, complete with strobe light and wracking sound effects. Don’t be off-put. Despite deep poignancy, there is also grand humor. Bartlett and her cast mates have excellent comedic timing, nothing is forced. The organic laughter arising from the audience even drowns out some of the funniest lines. It nary matters. You can’t help but laugh. Human frailty and arrogance is hilarious. And this production reminds you of that often and well. Little is as devastatingly humorous as the mother-daughter relationship. Central to the story is Brandt’s tenuous bond with daughter, Clara, played with virtuosity by Tami Feist. There isn’t a role in this play that doesn’t require courage, but Feist earns accolades among them. There is no diffidence in Feist’s Clara. Her character commits to her fear as well as her strength, coming to terms with her mother’s flaws and her brilliance. Clara, in Feist’s capable hands, discovers her own capacity to live as her mother is dying. Aaron Wexler’s Mike Clark is a wonderful foil to Brandt’s academic snobbery. Mike bridges the mother-daughter divide with loving practicality. He is Brandt’s nurse — a personification of everything she finds mediocre — and her daughter’s savior. Wexler is as fearless as Feist. He adroitly handles Mike’s clumsiness. The couple’s first date, complete with verbalized interior monologues, is priceless. Susan Blair, as Dr. Gertrude Ladenburger is divine. At first a haughty archivist, Brandt’s fixation wins her over, making the two women the best of friends. Together they pore over Beethoven’s sketches of the variations, in an archeological dig of self-discovery. The intricacy of this production is astounding. Dialogue overlaps between modern day and early 19th century. Every movement is absolute harmony. The set, designed by Feist, perfectly assists the transitions. The cast, left to right, Wexler, Feist, Susan Blair, Bartlett, Todd Gregoire, Rupert Hinton, (at piano) Susan den Outer, and (behind piano) Ross Druker. Rupert Hinton portrays Beethoven, with a slight British accent that is easily overlooked considering the boisterousness he brings to the role. Physically, he commands the stage, yet also shares well with others, which is required of the part. He brings a vulnerability to the composer that is both comical (pianist Susan den Outer does her best not to laugh during one scene in which she has a particularly awkward vantage point), and tender. Two men who equally exploit the master, Diabelli and Anton Schindler, Beethoven’s sycophant/manipulator/biographer, are portrayed by Ross Druker and Todd Gregoire, respectively. Both men are strong additions to the talented cast. The sole remaining cast member is atypical. Pianist Susan den Outer is hardly a guest in this orchestra, nor a soloist, but instead the heartbeat of the production. With as much emotion as any actor on stage — she is always on stage — den Outer is magnificent. Her perfection is not just in the notes played, but the absolute synchronization with the action surrounding her. She is no accompanist; she is an actor with a most vital voice. 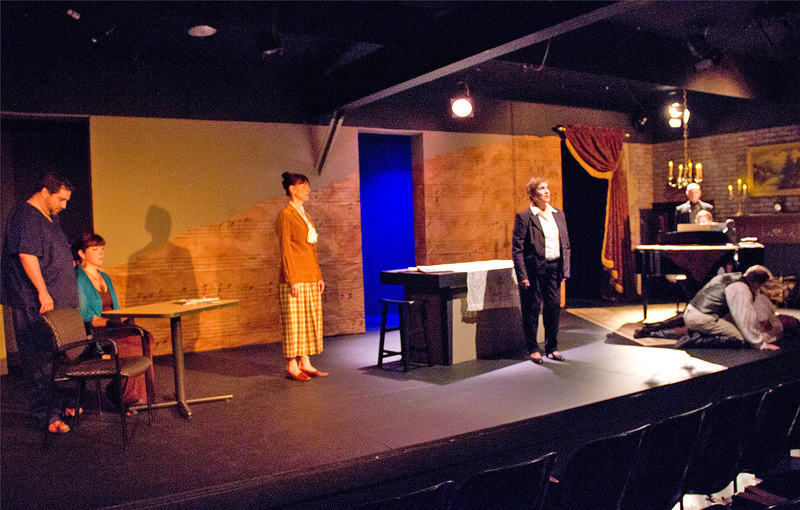 This entry was posted in Theater and tagged 33 Variations, arts, Beethoven, Bucks County, community theater, Langhorne Players, Pennsylvania. Bookmark the permalink.